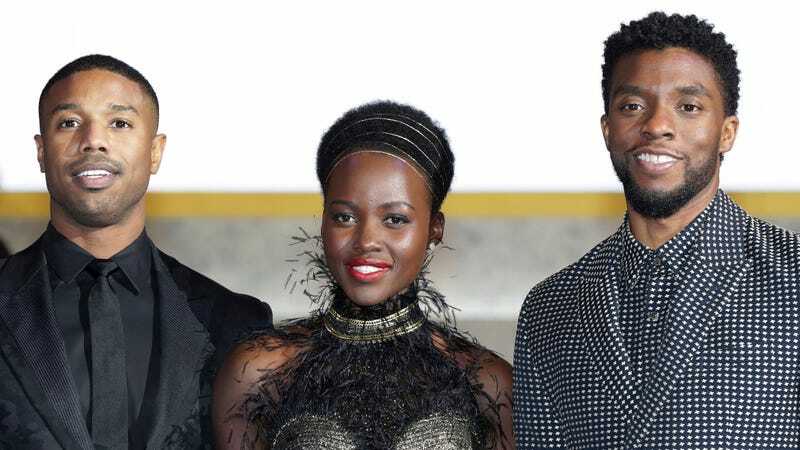 Actor Michael B. Jordan, Lupita Nyong’o, and Chadwick Boseman(Left to Right) arrive at the red carpet of the Seoul premiere of ‘Black Panther’ on February 5, 2018 in Seoul, South Korea. The African American Film Critics Association (AAFCA) have chosen this year’s award winners and their top 10 movie list, and the big winner is Wakanda, with Black Panther winning 2018 Best Film. Ryan Coogler was named Best Director and the Grammy-nominated “All The Stars” won Best Song. Selecting Disney’s Black Panther as the year’s best film was a no-brainer. Beyond its tremendous reviews and historic box office performance, the film changed the culture and became a defining moment for Black America. Finally, after years of painfully negative and blatantly harmful depictions of blacks on screen there was a movie full of positive images and characters that blacks could rally around. For many blacks the film’s release was like a national holiday. The movie sparked a sense of pride and inspired Afro-futurism-theme parties, academic panel discussions, scholarship funds, vacation plans to Africa and thousands of black kids dressing-up like their favorite characters on Halloween. Many have waited a lifetime for a moment like this and Black Panther delivered with a multi-generational appeal never before seen. The “Reginas” are setting a dominating trend this awards season, snatching both nominations and wins this year. Regina Hall won the Best Actress category for Support the Girls, while Regina King obtained the win for Best Supporting Actress for If Beale Street Could Talk. The best black male performances of the year were John David Washington (BlacKkKlansman) and Russell Hornsby (The Hate U Give), who took the Best Actor and Best Supporting Actor awards, respectively. The impactful heist thriller Widows, the much-discussed adaptation The Hate U Give, the eccentric Sorry To Bother You and the rousing Netflix documentary Quincy also land spots on the association’s top ten list. The top notables in television are HBO’s Insecure (Best TV Comedy) and OWN’s Queen Sugar (Best TV Drama). The popular Facebook sit-down, Red Table Talk, wins Best New Media. In coming weeks, the critics’ organization will also be announcing special achievement awards such as the Cinema Vanguard Award, the ICON Award, AAFCA’s Stanley Kramer Award and the its inaugural Pioneer Award. The AAFCA Awards ceremony will be held on February 6, 2019 at the Taglyan Complex in Los Angeles.